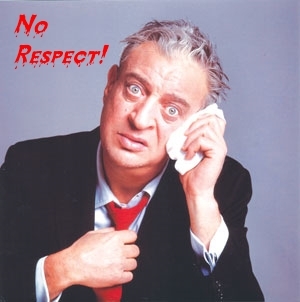 Rodney Dangerfield used to complain about not getting any respect. His entire career was built on this bit, driving every joke. No one respected Rodney - his parents, his wife, even his dog. Sometimes I feel like that about the University of Houston football team. As a University of Houston alumni I have followed the Cougar’s football exploits over the years, cringing at the bad and cheering at the good. If I didn’t already bleed red, I would bleed red. As a student I survived the 0-11 season and now as an alumni I enjoyed cheering the Coogs along to 12-1 (as of this writing). I have to tell you, the Cougars have never received the respect they deserve. They are the Rodney Dangerfield of college football. If you follow FBS football, you might wonder how I can suggest they get no respect, be it that they were ranked No. 6 in the nation before losing the C-USA Championship game. It comes down to this - the nation’s sports writers, bloggers, and pundits always seemed to grudgingly give UH some credit while eagerly waiting the day they would fall from grace. Now, after being thoroughly out-played in their last home game, the national “I told you so” will begin. The BCS system has taken a collective sigh of relief. The lack of respect will continue. Despite the grudging national attention, the Cougars have held their heads high the entire season, playing with class. I have seen games where they kneeled the ball on the 5 yard line three times in a row to avoid running up the score, where the coaches subbed the starters early in the fourth quarter to avoid embarrassing an unmatched opponent, I have seen class from Coach Kevin Sumlin and the players alike. I have respect for the University of Houston. Unfortunately, some of the excitement I felt at attending the C-USA championship game was muted by the actions of others (not the disappointing football performance by my Coogs, though). Our seats were great, on the 35 about half way up the visitor side. We were surrounded by a sea of red - it was awesome. I have never heard Robertson Stadium so loud. Then, the drunks started up. Mixed into the true-hearted Cougar fans were the slovenly drunks eager for nothing more than to shout obscenities at everyone. I didn’t realize that college football was more about how many beers you can spill on an 8 year old boy than it is about cheering your team on. I heard many words spew from the mouths of these men (not college boys) that I hadn’t heard since I myself was an undergraduate. Did I mention the 8 year old boy? Did I mention the 6 year old girl sitting with her parents dressed like a UH cheerleader? After halftime, the young boy and his father did not return to their seats. I assume they were tired of showering in a mix of beer and spit. The parent of the little cheerleader spoke up during halftime to one of the men. At least he had the grace to realize how offensive he had been and promptly sat down, falling into an embarrassed slumber for the third quarter. There was a tussle where one of the drunks wanted to smoke a cigarette in the stands. He had already smoked one. This time the other drunks corralled him. He disappeared a little bit before the cops came by. Another drunk was reprimanded for his language by security. He slowed it down for a little while, but started back up not long after they left. I will take solace in the fact that, as far as I could tell through their conversation, most of them were not UH alums, because their behavior demonstrated that they had no respect for themselves or for the Cougars. As a result, I have no respect for them. Then there were the fans who walked out on their Cougars with eight minutes remaining in the game. Sure, they were down by 21 at that point, but this is when a team absolutely needs their fans. Instead, the exits were filled with rivers of red, clogged with people who came only to see a victory, not with fans who came to support the University of Houston, win or lose. It would appear that half of the 32,400 people that were at the game didn’t respect the Cougars enough to stay through to the end (or at least closer to the end). During the fourth quarter, there were about ten players Southern Miss players who chose to heckle and ridicule the fans instead of supporting their team in a well deserved victory. I know heckling is part of the game, especially in a stadium with seating so close to the bench. But, these young men took it too far. At one point a coach reprimanded them, but they ignored even their own staff to continue goading the fans. They were apparently unfamiliar with the term “good sportsmanship.” Their lack of respect for the University of Houston extends to their own school, for they were not representing their team very well. Regardless of all the disrespect, I have to say it was not contagious; I still respect my Cougars, as do many Houstonians. Just like how Rodney Dangerfield earned the respect of his fellow comedians and fans, I am sure, as long as UH keeps doing what they do, eventually people will learn to respect them.